REYNOLDS, Ga. – SFG Promotions kicked off the FTI Performance World Series of Bracket Racing on Wednesday with a $15,000 to win bracket race sponsored by InMotion Solutions. Originally scheduled as a $5,000 to win event, SFG decided to up the ante by adding $10,000 to the winner’s purse. At the quarterfinal round it was Bruce Liberman, John Brown, Lester Adkins, and Don Hansen on the dragster ladder and Max Brewer (Vega), Scotty Richardson (S-10), Leon Robertson (S-10), and Lucas Walker (Mustang) on the doorcar ladder. Liberman advanced to the semifinals after Brown turned it red and Adkins used a .017 light and .01 above to stop Hansen on the dragster ladder. On the doorcar side Brewer defeated Scotty Richardson for the second straight round, using back-to-back .000 lights, while Robertson took an easy win after bottom bulb racer Walker slowed down track. In the semifinals it was Adkins taking the easy win after Liberman missed the tree while Robertson advanced on Brewer’s red-light. 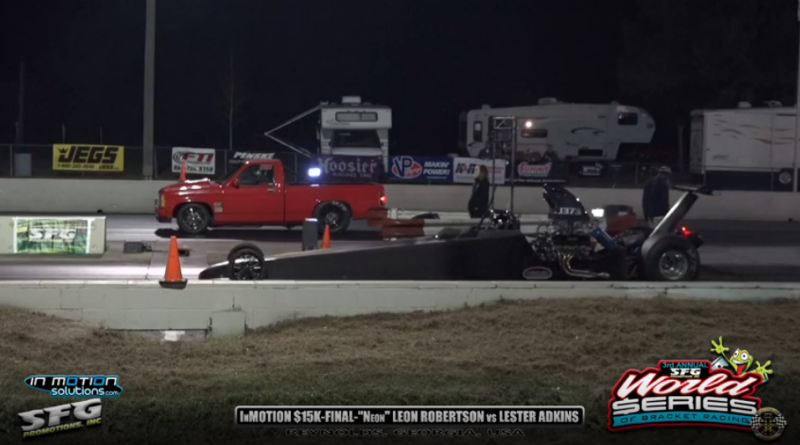 In the final round, Neon Leon had the advantage at the starting line, posting a .007 light in his S-10 truck to Lester’s .015, but missed the dial at the top end. Robertson’s .023 above 6.223 came up .006 short as Adkins posted a dead-on 4.539 for the win. On tap for Thursday is another $15,000 to win event as the last warm-up prior to three $50,000 to win races scheduled for Friday, Saturday, and Sunday at Silver Dollar Motorsports Park. For more coverage of the SFG World Series of Bracket Racing, click here for the event flyer and links to the live feed to watch online. DragChamp is your source for SFG World Series of Bracket Racing coverage, visit daily for the latest bracket race results. ← Watch The SFG World Series of Bracket Racing Live Online!